Celestial Seasonings, the celebrated Boulder herbal tea company, offers free tours showing visitors how teas are blended and packaged. The pungent Mint Room alone makes the visit worthwhile. Free samples of cold and hot teas are served in the gallery, which features teapots and artwork that illustrates the tea packages. 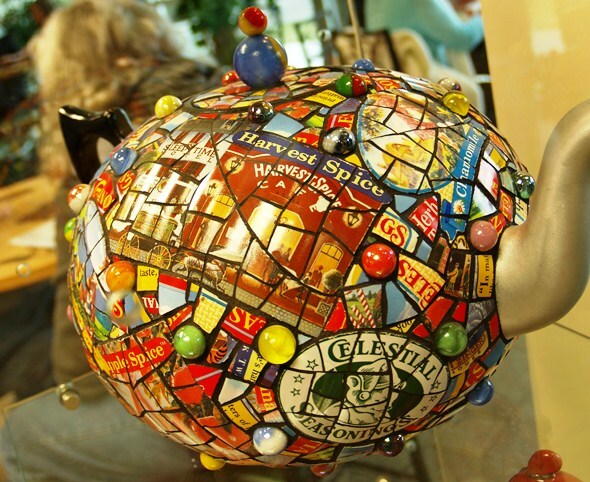 There is also a café and gift shop with a dizzying array of teas, teapots, tea-related clothing and other goodies. Celestial Seasonings began in 1969, selling 10,000 hand-sewn, cloth bags of bulk herbal tea in Boulder’s natural food stores. Founder Mo Siegel and his compatriots hand-picked most of the herbs and flowers in the mountains around Boulder. Its most popular tea is Sleepytime – a blend of chamomile, spearmint, lemongrass, tilia and other herbs developed in 1972. The company has sold more than 2 billion bags of Sleepytime. Another of its early flavors, Red Zinger, became famous through the Red Zinger Bicycle Classic, a professional race through Colorado during the 1970s. The company was sold to Kraft Foods, then bought back by Siegel and others. It merged with natural foods maker Hain Food Group in 2000 to form the Hail Celestial Group. The factory and headquarters were built in 1990. Today, the company serves more than 1.6 billion cups of tea each year and uses more than 100 ingredients from 35 countries in its herbal, green, red, white, chai and wellness teas. Factory tours take visitors past bins containing the worldwide collection of herbs and flowers used in the teas and the mechanized equipment that blends the teas and places them into bags and cartons for sale. Mint is kept in a vault so that it does not contaminate the other ingredients, and visitors stepping inside experience an overpowering scent of pungent mint that clears the sinuses and causes the eyes to water.